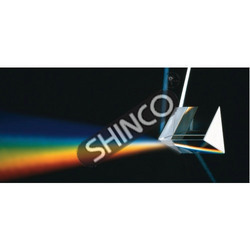 We are a leading Exporter of direct vision spectroscope, advanced spectrometer, spectrometer prism, equilateral, glass and spectrometer, student from New Delhi, India. Owing to the dexterous professionals, we have been able to provide the clients with a commendable assortment of Direct Vision Spectroscope. 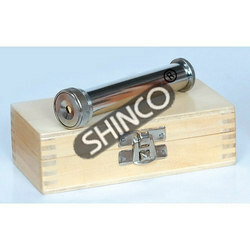 We manufacture these products for quantitative examination of spectral composition of white light and radiant bodies. Our valuable customers can utilize our range according to the clients need. For quantitative examination of spectral composition of white light, radiant bodies etc. 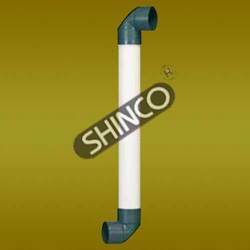 Comprises a metal draw-out tube of 20 mm diameter, with an adjustable slit at one end. The light passing through this slit falls on the prism elements and break up into a spectrum. This Direct Vision Spectroscope can be viewed through an eye piece at the other end of the tube. Fully drawnout length is 130mm. Supplied in a wooden box. Similar to 3380-00 but with enhanced features for obtaining better quantitative results. 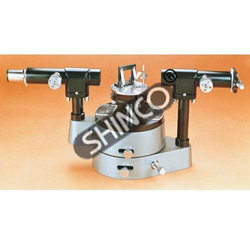 Consists of a heavy cast base and a pillar for collimator support. The telescope arm moves along a fixed circular plate 150mm diameter graduated in degrees. This Advanced Spectrometer has a double ended vernier for better and accurate measurements, with a least count of 30”. Fine adjustment is accomplished by using a knob while the coarse adjustment can be done by hand. Both the collimator and the telescope are mounted with an axis adjustment system. The telescope has a 10X Ramsden eyepiece and is fitted with a cross hair reticle. Both the telescope and the collimator are fitted with coated achromatic objectives of 178mm focal length and 32mm diameter, providing light for a brighter and sharper image. The focussing is done by a concealed rack and pinion. The collimator slit 6mm long, is specially designed for retention of initial accuracy during the life of the instrument. The prism table 75mm diameter is held with the help of a clamping screw enabling the table to be rotated in any direction. It has lines and concentric rings marked to assist positioning of prism in relation to levelling screws. It is fitted with a diffraction grating holder of aperture 25mm x 25mm and a clamp for holding prisms upto 38mm high. Provided with a magnifying eye glass to read the vernier, tommy bar for axis adjustment and flannel cloth. Supplied in a wooden box. An important accessory for college level spectrometry work. Dimensions: (face x height), 32 x 32mm. Individually packed. For introducing students to principal type of spectra, determination of wavelength, frequency of emitted light and for quantitative spectrometric measurement of angle of prism, refractive index of the prism material etc. Comprised of a cast base with an integral fixed pillar for the collimator support and a swinging telescopic arm. Both the collimator and the telescope are fitted with an axis adjustment system. 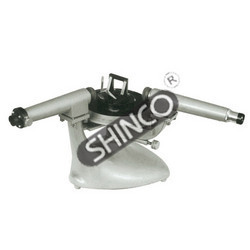 The moving telescope arm with a spring loaded vernier moves smoothly over a machine engraved degree plate of diameter 180mm and is graduated 0-360º x 1. The vernier reads to 0.1º or 6 seconds and allows students to estimate angular positions to 0.05º. Fine adjustment is provided. The collimator and the telescope tubes are fitted with optically coated achromatic objectives of diameter 25mm and have a concealed helical action focusing device. The 10X Ramsden eyepiece has a cross hair reticle. The prism table, diameter 75mm is levelled by three knurled knobs. It is fitted with a diffraction grating holder of aperture 25 x 25mm and a clamp for holding a prism up to 38mm high. Provided with a magnifying eye glass and a tommy bar for axis adjustment but without prism or diffraction grating. Supplied in a cardboard box.